Over the past year many books have been recommended to me, but the one cited most often was a book about food. Several people told me that I HAD TO READ this book. Well I finally did and boy were they right. 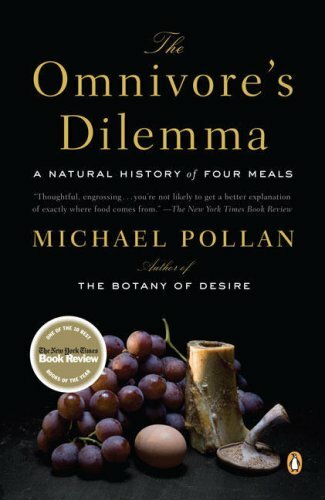 The Omnivore’s Dilemma: A Natural History of Four Meals by Michael Pollan was a perfect compliment to better understanding my own journey with food. This book answered many of the questions I had about how food is processed in this country. What does organic and free range really mean? Why is processed corn in so many food items? Why is our relationship with food so neurotic? All these questions are addressed and never once does the author preach or promote an agenda. The first section of the book is about Industrial Corn. I knew it was bad, but I had no idea just how bad it is. The first 100 pages of this book should be read by every American. I already eat a very healthy diet so I wasn’t scared straight, but it alerted to be a little more diligent in paying attention to amount of corn-based processed foods I reach for. The second section is called Pastoral Grass. It covers the alternative. Organic, free-range, grass-fed and natural processing of crops and animals are explained in this portion of the book. Excellent stuff. The third section is called The Forest. This portion covered ethics of eating animals, hunting and looking for mushrooms. Although this part of the book might be interesting to ethical vegetarians, I found this entire section of the book boring and tedious. The author spends almost 30 pages hunting for mushrooms. Make it stop. I highly recommend the first two sections of the The Omnivore’s Dilemma: A Natural History of Four Meals by Michael Pollan.